John Hernan Raigoza & Yaisuri Salamanca are an award-winning professional Argentine tango couple with more than 15 years of experience. Recently, they won fifth place in the semifinal at the Argentina Tango World Cup Championship in 2018, and third place In 2008. Their combined expertise includes Arrabal Tango Musical, 37 theaters from the United Kingdom and West End of London, and the most prestigious tango houses and Milongas from Buenos Aires. Yaisuri and John were the highlight of our event! Their amazing performance was enjoyed by all during the closing Alumni Reunion Day 2018 at NYU. They are indeed great dancers and engaged the important guests of our event perfectly. Thank you so much for your kind words, Milton. We really appreciate you taking the time out to share your experience with us. We work hard to meet expectations like yours, and we’re happy to hear we hit the mark for you. We count ourselves lucky for organizers like you. We look forward to working with you again in the future! What do you get when you mix desire with capable body mechanics with showmanship with uncompromising energy? You get John Hernan Raigosa and Yaisuri Salamanca. This professional Argentine tango couple has won numerous awards and fans wherever they travel throughout the world. They dance with equal amounts of fire, passion and combustion. While watching them perform, their faces tell you that they love to dance. I have seen John perform with a mop, a broom, even bare chested. The outcome is the same...this couple lives to and loves to dance and they very easily bring the audience along for the ride with them. Yaisuri and John performed at Milonga Mala Leche in New York City in October, 2017. Just as I expected, the audience would not let them leave the floor. The New York audience is discriminating and discerning because they have seen many high quality performers over the years and as a result, they can easily identify quality. If you are planning an event this is the couple to invite to perform. Batt Johnson, author of "Tango Intoxication-Wit, Wisdom, Stories & Secrets of the World's Most Intimate Dance"
Price Range: Please contact for details! A high-quality Tango Show which includes Argentinian Folk dances such as Tango, Milonga and Vals suitable to audiences who enjoy from traditional to modern and theatrical performances. Yaisuri Salamanca and John Hernan Raigoza are an award-winning professional Argentine tango couple with more than 15 years of performing experience. They dance with explosive strength, playful creativity, and a powerful emotional connection. 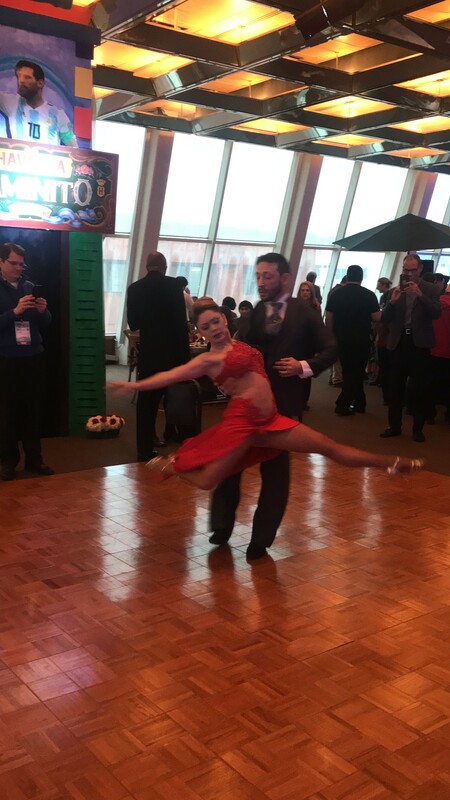 Their style is firmly grounded in authentic tango learned from Argentine masters enhanced by technique gained from training in ballet, jazz and Latin dance. It is this dynamic style that earned Yaisuri and John third place in the stage tango category at the 2008 Tango World Championship in Argentina and has captivated audiences on both sides of the Atlantic Ocean. Together and separately they have performed as featured dancers in major tango shows in Buenos Aires, New York City, and London, as well as at a variety of events in the United States and Latin America. In addition to their performing prowess, Yaisuri and John are experienced teachers who are passionate about sharing their knowledge of tango with dancers of all levels. Yaisuri was a principal dancer in the 2012-2013 West End production of the musical Midnight Tango in London, England, and has also danced with a major South American tango dance company. Her training in classical ballet, salsa and traditional South American folk dances has enriched both her dancing style and technique. John started dancing tango in Buenos Aires in 1997, where he studied with highly respected tango masters. Recently, he was part of the Tango Musical Arrabal, at the ART Theater located in Cambridge, MA. He has also performed in popular Buenos Aires tango shows such as Sabor a Tango and Voz Tango. His personal style is based in traditional tango and informed by training in theater, contemporary dance, jazz, and salsa. John Hernan Raigoza & Yaisuri Salamanca are an award-winning professional Argentine tango couple with more than 15 years of experience. They won third place in the tango stage category at the 2008 Tango World Championship, in Buenos Aires, Argentina. Their combined experience includes Arrabal Tango Musical, 37 theaters from the United Kingdom and West End of London, and the most prestigious tango houses and Milongas from Buenos Aires. Here in the USA, they have taught across the West and East coast. Currently, Yaisuri and John Hernan are touring around the world. In addition to teaching and performing, Yaisuri designs her line of Tango shoes. - Won Third Place World Tango Championship, Buenos Aires, 2008. - Won Fifth Place World Tango Championship, Buenos Aires, 2007. - Won First Place World Tango Championship, Colombia, 2007. Los Mareados Milonga, Rio de Janeiro, Brasil. La Nacional Milonga, Buenos Aires, Argentina. Arrabal Tango Musical, American Repertory Theater, Cambridge, MA, USA. San Miguel de Allende Tango Festival, Mexico. El Encuentro Milonga, Los Angeles, USA. The Tango Experience Milonga, Los Angeles, USA. Nocturna Milonga, San Diego, USA. Russian Dance Festival, San Francisco, USA. Milonga La Paz, San Francisco, USA. Tango Mercurio School, Washington, DC, USA. Milonga Porteña, Washington, DC, USA. Milonga Zandunga, Washington, DC, USA. Eastern Market Milonga, Washington, DC, USA. Burning Tango Festival, McCloud, CA, USA, 2014 - 2016. Stardust Dance Weekend Festival, New York, USA, 2016. Thalia Spanish Theatre Tango Production, New York, USA, 2014 - 2016. The United Nations Gala, New York, USA, 2015. Monk Tango Concert, Flushing Town Hall, New York, USA, 2015. FIT International Dance Festival, New York, USA, 2014 -2015. Malbec Tango House Dinner Show, New York, USA, 2014. Toronto Tango Summit, Canada, 2014. New York Tango Festival, USA, 2014. DC Bachata Congress, Washington, 2014. Tango Recuerdo with Mariela Franganillo, New York, 2014. Midnight Tango, London, England, United Kingdom, 2012 - 2013. Midnight Tango Tour, United Kingdom, 2012-2013. Sabor a Tango and Voz Tango Dinner Show, Buenos Aires, Argentina, 2011 - 2013. Tango Palace Dinner Show, Buenos Aires, Buenos Aires, Argentina, 2009 - 2011. Casa do Tango, Rio de Janeiro, Brasil. Academia Marquinhos Copacabana, Rio de Janeiro, Brasil. Sala de Dança Luciano Bastos, Rio de Janeiro, Brasil. The Tango House, Buenos Aires, Argentina. Loeb Drama Center at American Repertory Theater, Cambridge, MA, USA. LA Tango Academy, Los Angeles, USA. The Tango Experience School, Los Angeles, USA. The Tango Room School, Los Angeles, USA. Centro Cultural de la Raza, San Diego, USA. Tango Essence School, San Diego, USA. New York Garden Tango School, USA. Matices Tango School, Cali, Colombia. The Tango School, Matices, Colombia, 2016. West Coast Workshops: San Diego, Los Angeles, San Francisco, McCloud, Eureka and Seattle, USA, 2016. New York, Fall Bootcamp, USA, 2016. Red Bank Seminars, New Jersey, USA, 2016. Seattle Tango Week, Seattle, USA, 2016. Burning Tango Festival, McCloud, CA, USA, 2016. Eureka, San Francisco, Los Angeles, San Diego, USA, 2016. Stepping Out Studios, New York, USA, 2012-2016. Individual workshops in Argentina, Ecuador, Brasil, Colombia, United Kingdom, and United States, 2008-2015. Washington, DC Tango Festival, USA, 2014. Taught and performed at milongas in Buenos Aires such as El Beso, El Yeite, Porteño y Bailarín, and La Viruta, Argentina, 2007-2014. The Harvard School of Public Health Tango Club, Boston, MA, USA, 2012. 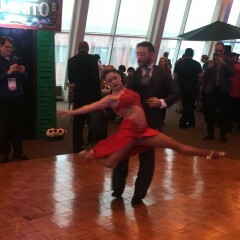 Massachusetts Institute of Technology (MIT) Tango Club, Cambridge, MA, USA, 2012. As Tango Dancers, we perform lots of pivots and long walks. Therefore, the ideal floor to dance would have a smooth and even surface. Our music will be available in mp3 format. We could send the music via email to the DJ previous to the event, or we could also bring the music in an iPad which requires a mp3 cable to connect it to the sound system. Room to change and do our make up is highly recommended. If any of these technical details are not available, please let us know in advance. We will always do our best to adapt to the event. We have training in classical ballet, theater, jazz, contemporary dance and salsa. These styles have enriched our tango training, and performing repertory based on the essence of the traditional tango.